Diane von Arx is the only person who could have kept our attention indoors for two eight-hour days on the first beautiful weekend of Spring. But keep it she did! 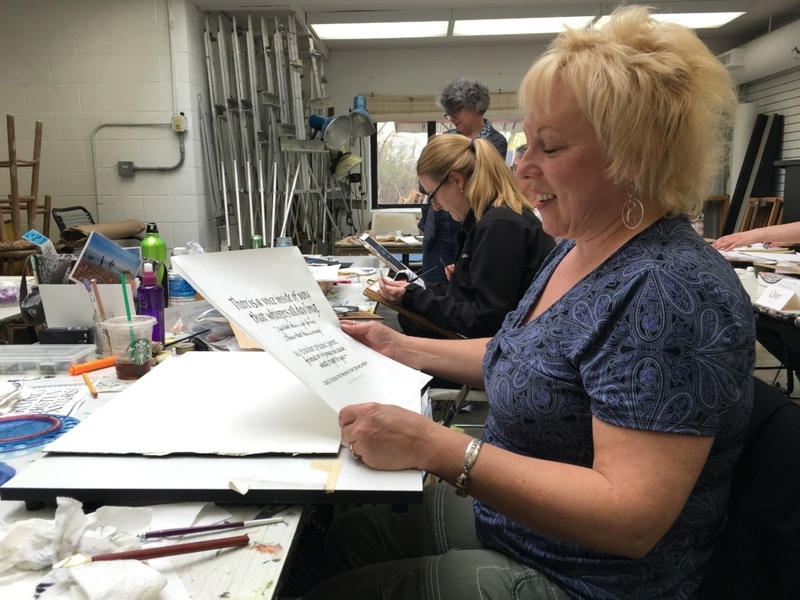 There were thirteen of us at the Edina Arts Center to gather pearls of wisdom from Diane’s workshop, “Layout & Design: Approach, Attack, Conquer!” on April 22-23. 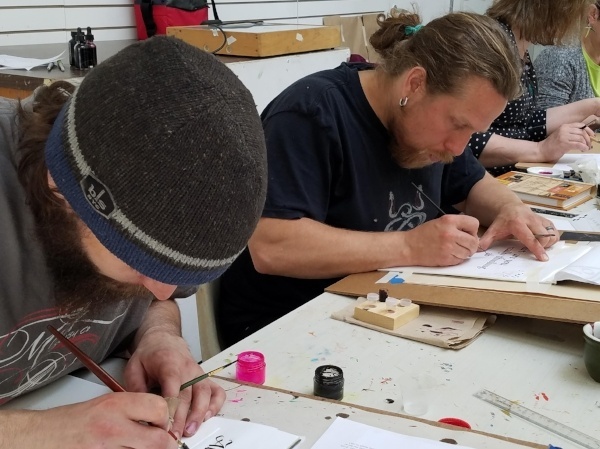 This was a much requested workshop by many of our members who are newer to calligraphy and the organization (no one in the class had been a member of the Colleagues longer than seven years). 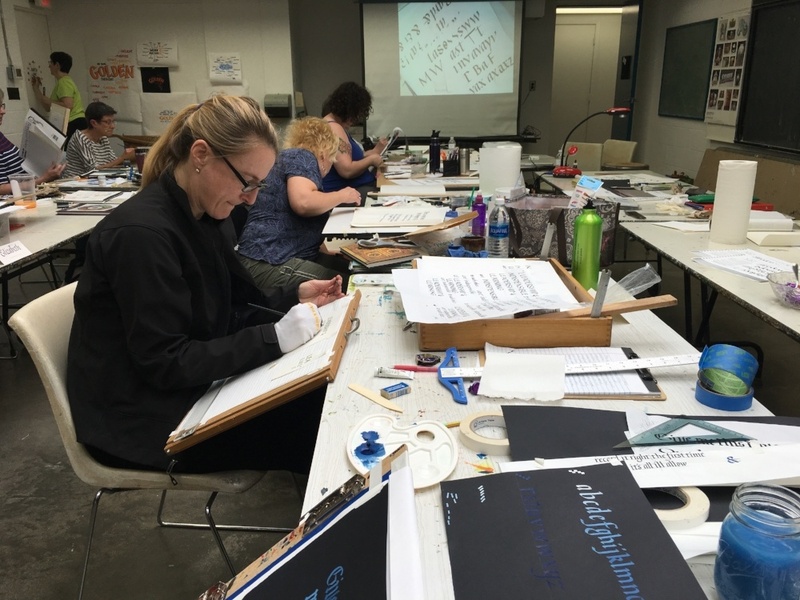 Students came to this class with varied areas of focus: watercolors, large format illustration, Chinese brush lettering, to name a few. But all of us wanted to learn the mysteries of layout, how to build lettering work that is pleasing to the eye. For me, my slightly over-packed life meant it was a treat just to put pen to paper, and I could feel my body and mind opening up to the class and to learning as soon as I loaded my nib with ink and put that to paper. Students arrived having selected a quote with which we wanted to play. My own example: “Leadership and learning are indispensable to each other” (John F. Kennedy, Jr.). On day one we talked about approach, considering the emotion of the quote, words that had pop, and how we wanted to lead the viewer’s emotions and response. The seven tools at our disposal: line, color, texture, shape, value, size and direction. After writing out the quote, determining layout, line and spacing widths, and learning how to transfer all that information onto our good paper without too much scarring (to us or the paper! ), day two was focused on working with gouache to execute our work. 2. Move a tool. Don’t stare at a blank page. 3. In design, if it solves a problem, it’s not cheating. And using guide lines and slant lines is NOT cheating. Corollaries: If it solves a problem, do it. If it creates a problem, don’t do it. 1. Within a word, all downstrokes are equidistant. This leads counter spaces (negative space inside a letter) to match spacing between letters. 2. Flip a line or word upside down, cover the top half, and look at the degree of crowdedness – this will help identify the places where kerning (space between letters) is too great or too little. 3. Ligatures are a connection of two letters where a common stroke is shared by both letters. They are allies in perfecting the spacing within a line, e.g. be, ur, oe, re, an, WA, and HE. 4. Keep lines of the same hand together in a block of text; they’re family. There should also be a bit more space, just enough, between each block of a different size text. 5. As letter spacing closes, line spacing will need to increase to ensure legibility. In other words, balance letter and line spacing to achieve “just enough” legibility. 1. Never forget the power of counter space/negative space. 2. To help pick the tints and shades that are the best value for your paper, write an alphabet like this on a sample of that paper: for letters A through M start lettering with white. To tint, gradually add more and more of your chosen pigment until the blended color is 100% your chosen color. For letters N through Z, gradually add black to create gradations of shades, until the color is gone and the letter is black. 3. 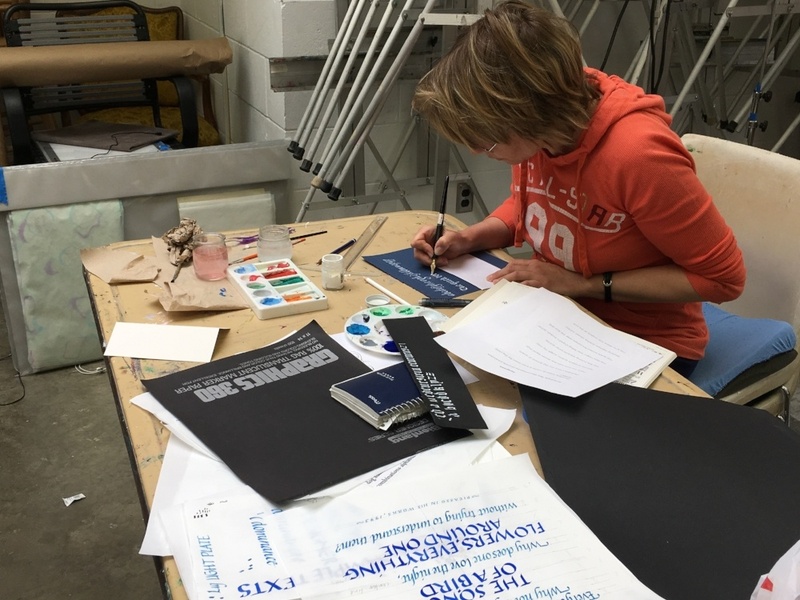 To build a subtle visual connection between your chosen color and the paper, add a little gouache that is the same color as your paper to your chosen color. This works best when lettering with white on a colored paper. 1. All you need is a little knowledge and a lot of nerve. 2. A line and/or other ornamentation can be used to fix areas of too much space. 3. Don’t think about where flourishes are going to go. Any worrying will take the life out of the flourish. 4. Guidance for flourishes: Up - down - over - under. 5. When flourishing, if you end up with a skip in a length of your line, don’t pursue the impossible task of retracing your exact original flourish. Instead, create a visual bridge by adding a flourish line parallel to where the darker, skipped length of line would have been. 6. In your final piece, it is sometimes easiest to work from the most challenging element to the easiest. That way, you will have the least amount of the project to redo if you have errors. The refrain heard from students throughout the weekend, “Ohhhhh, that’s how you do that!” became a chorus of thrilled and satisfied students by the end of the workshop. Each of us gained so much in fundamentals of how to create a calligraphic work that it was hard to imagine not having learned it sooner. At the end of our weekend, this sentiment was summed up in the most flattering way imaginable by one student who surely spoke for everyone when he said, “Everything has changed since two days ago.” Bravo, Diane and students! 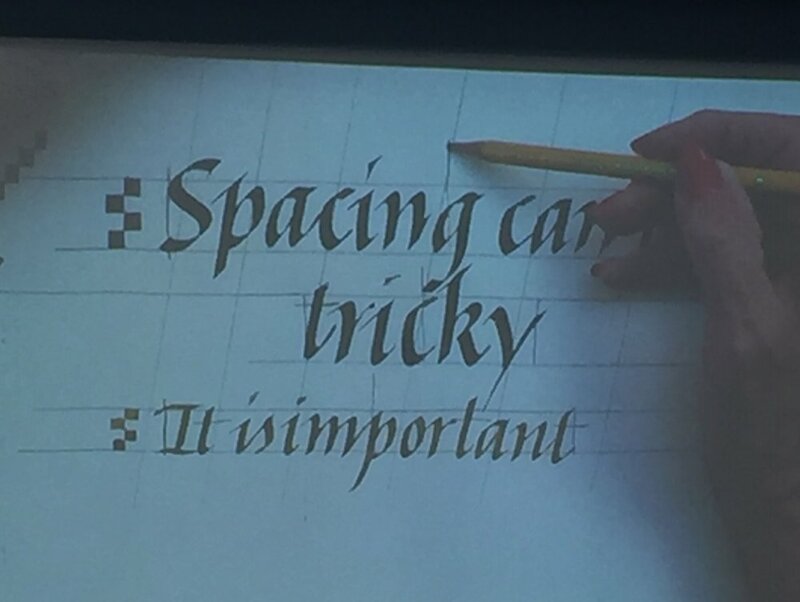 Newer Post“Looking Back to Looking Forward: Calligraphy - Its History, Its Mystery, Its Wonder”: a Program Presented by Gemma Black.